Great location, friendly, could use some updates. Room was nice, very clean, but could use USB plug ins, and a mini-fridge would be nice for those traveling. Pretty quiet. 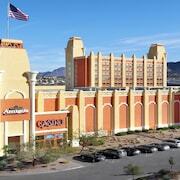 Good casino and great buffet with great price.. Which hotels are closest to the Henderson airport? Can you find accommodation in popular areas of Henderson? Where to stay near top Henderson attractions? What kind of hotels are in Henderson? 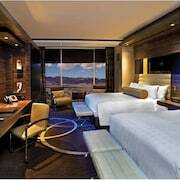 Which hotel chains are in Henderson? Families will find kid-friendly activities in Henderson, and visitors give high marks for the casinos, shopping, and top-notch restaurants. Tourists who journey to this relaxing city can discover its mountain views, lakeside, and entertainment choices. Top sights in the city include Clark County Museum, Ethel M Chocolates Factory, and Ethel M Botanical Cactus Gardens. The city's cultural venues include Clark County Museum and Ethel M Chocolates Factory. The city's mountain views and lakeside provide a picturesque setting and places to visit include Ethel M Botanical Cactus Gardens. Shopping is a favorite activity, so consider an excursion to The District at Green Valley Ranch and Galleria at Sunset. 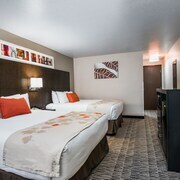 The M Resort Spa Casino - With a stay at this 4.5-star resort, guests can enjoy access to a full-service spa and a casino, along with an in-room iPod dock. 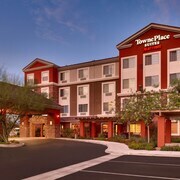 It's a favorite with Expedia travelers for its overall value and helpful staff. 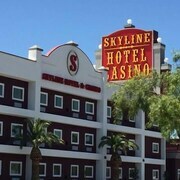 Skyline Hotel & Casino - Our customers like the dining options and breakfast at this hotel. This 3-star hotel features a casino, a restaurant, and free WiFi. 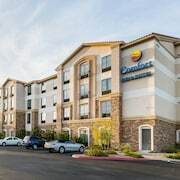 Hampton Inn & Suites Las Vegas South - With a stay at this 3-star hotel, guests can enjoy access to free breakfast and an outdoor pool, along with free WiFi. Expedia customers like its breakfast and clean, comfortable rooms. Popular places to see around the area include Las Vegas Strip, located 12.7 mi (20.5 from the city center, and Las Vegas Convention Center, which is 13.7 mi (22.1 away. Henderson is a family-friendly, upscale neighbourhood with convenient options for restaurants, bars, and cafés. Part of the neighbourhood's charm is its friendly people. You can experience some local live music, or enjoy the natural beauty of the desert. 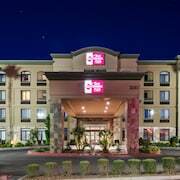 Start by booking your hotel in Henderson, and then enjoy the sights in the greater Boulder City area. The casinos and many other highlights await you. Clark County Heritage Museum, Clark County Museum, and Ethel M Chocolates Factory feature a variety of exhibits. You can buy tickets to live performances at Smith Center for the Performing Arts. 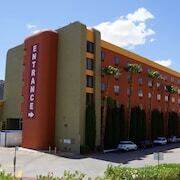 Some landmarks that can't be missed include Grace Community Church, Las Vegas Hotel & Casino, and Sahara. Create some family memories at The Linq, High Roller, and Fremont Street Experience. Popular activities in the area include shopping, dancing, and attending sporting events. Henderson Amphitheater, Henderson Events Plaza and Amphitheatre, and Sam Boyd Stadium are great places to catch a game or event. An enjoyable day at the park is awaiting you at Henderson Bird Viewing Preserve, Ethel M Botanical Cactus Gardens, or Bootleg Canyon Mountain Bike Park. For retail therapy, consider Galleria at Sunset, The District at Green Valley Ranch, and Boulevard Mall, and seek out the perfect souvenir. A visit to Black Mountain Golf and Country Club, Tuscany Golf Club, or DragonRidge Country Club won't disappoint either. A few of the most popular sights in the area include University of Nevada-Las Vegas, Hoover Dam, and Boulder City Hoover Dam Museum. 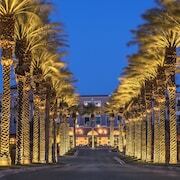 Touro University Nevada, Wildhorse Golf Club, and Henderson Pavilion are other top spots to see. 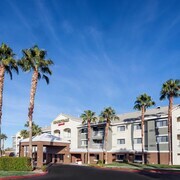 Henderson is 16.3 km (10.1 miles) from the airport in Las Vegas, NV (LAS-McCarran Intl.). 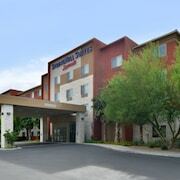 What are the most popular hotels in Henderson? 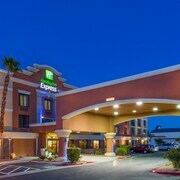 Are there hotels in cities near Henderson? Explore Henderson with Expedia.com.au’s Travel Guides to find the best flights, cars, holiday packages and more!